Outdoors • Utah's national parks see a surge in visits in 2015, and NPS leader expects 2016 to be another record year. 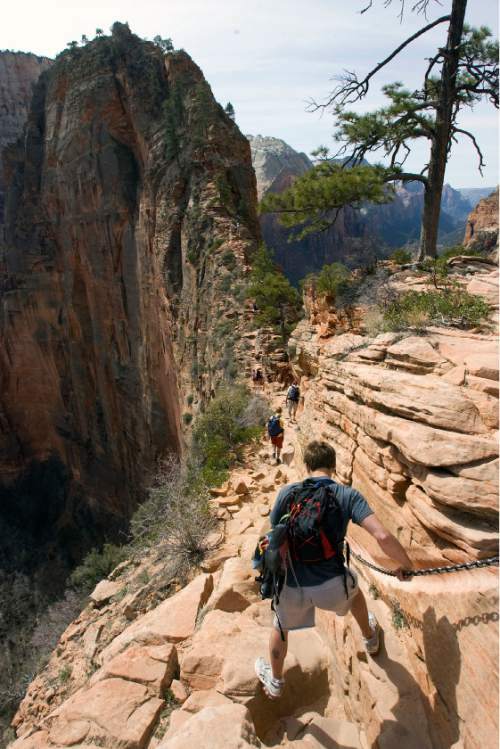 Al Hartmann | The Salt Lake Tribune Hikers pick their way up and down the Angel's Landing Trail, one of the premier hikes in Zion National Park. It takes hikers up a steep rock spine that climbs to a magnificent view of the Virgin River and Zion Canyon below. The National Park Service handled a record number of visitors last year and expects to break records again in 2016, its centennial year. Trent Nelson | Tribune file photo The sun sets on peaks overlooking Springdale in October 2013. The National Park Service handled a record number of visitors last year and expects to break records again in 2016, its centennial year. 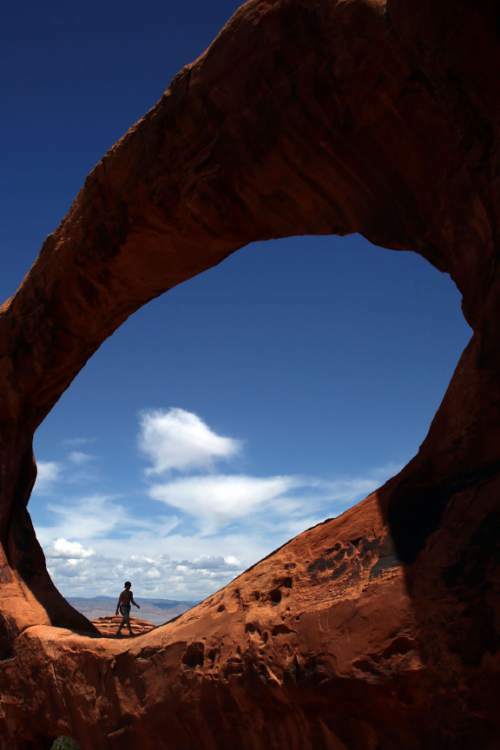 Francisco Kjolseth | The Salt Lake Tribune Visitors to Arches National Park in 2013. The National Park Service handled a record number of visitors last year and expects to break records again in 2016, its centennial year. Francisco Kjolseth | The Salt Lake Tribune Arches National Park in 2013. The National Park Service handled a record number of visitors last year and expects to break records again in 2016, its centennial year. 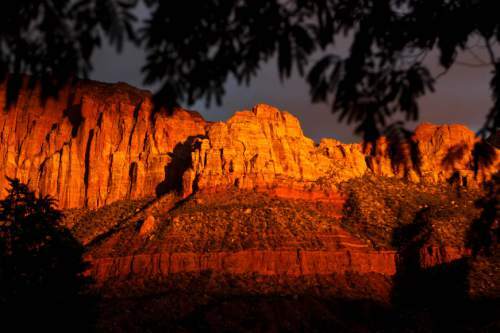 Trent Nelson | The Salt Lake Tribune The late afternoon sun lights up the entrance to Zion National Park, Thursday, October 10, 2013. The National Park Service handled a record number of visitors last year and expects to break records again in 2016, its centennial year. 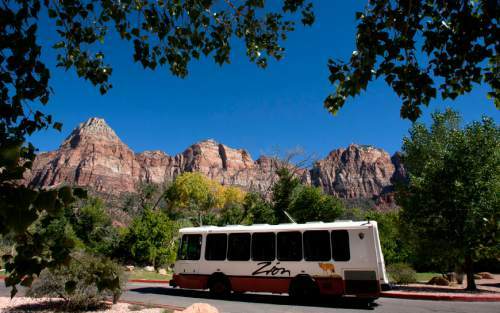 Steve Griffin | The Salt Lake Tribune A shuttle bus leaves the Zion Canyon Village just outside Zion National Park near Springdale, Utah Monday, September 30, 2013. The National Park Service handled a record number of visitors last year and expects to break records again in 2016, its centennial year. 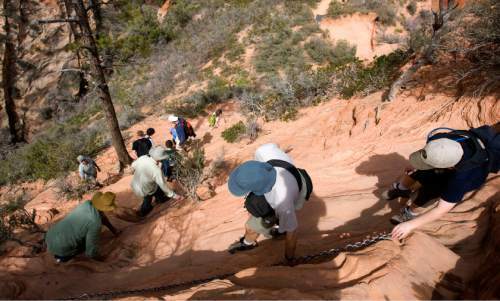 Al Hartmann | Tribune file photo Hikers carefully make their way up a section of the Angels Landing Trail in Zion National Park in March 2009. The trail offers one of the premier hikes in the park, taking visitors along a steep rock spine that climbs to a magnificent view of the Virgin River and Zion Canyon below. The National Park Service handled a record number of visitors last year and expects to break records again in 2016, its centennial year. 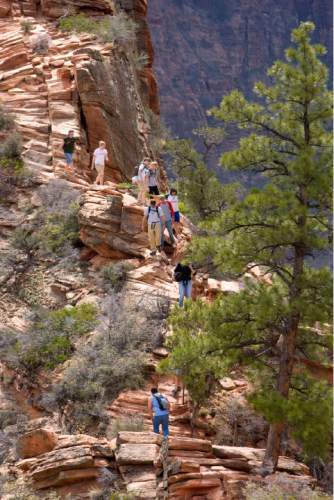 Al Hartmann | The Salt Lake Tribune Hikers carefully pick their way down the Angel's Landing Trail in Zion National Park. It's one of the premier hikes in the park which takes the hiker up and a steep rock spine that climbs to a magnificent view of the Virgin River and Zion Canyon below. The National Park Service handled a record number of visitors last year and expects to break records again in 2016, its centennial year. The National Park Service handled a record number of visitors last year and park crowding has achieved epic proportions at some of Utah&apos;s marquee destinations. But crowding can be reduced through smart planning and outreach that spreads use into less busy times and less visited places, according to director Jonathan Jarvis. Not so easily fixed, he said, is young adults&apos; apparent lack of interest in the nation&apos;s natural, historic and cultural treasures that Jarvis&apos; agency oversees. As the NPS approaches its second century this August, the Department of Interior will oversee a series of events, programs and initiatives to connect with the millennial generation, whose members range in age from roughly 18 to 35. "The goal is not just a celebratory birthday cake, but focuses on what&apos;s the next century of the National Park Service going to be about and how do we engage the next generation in taking care of the parks," Jarvis said during a recent visit to The Salt Lake Tribune&apos;s editorial board. He&apos;s concerned that millennials, not as connected to the outdoors as their parents and grandparents, may be far less inclined to support a system that has been heralded as "America&apos;s Best Idea." "If the park service doesn&apos;t build a new constituency, our longer term future is at risk, to be blunt about it," said Jarvis, who was in Salt Lake City to share this message with the Outdoor Retailer winter market last week. "This particular industry also needs to build a new constituency." Aiding in this mission is the National Park Foundation, which has hired a Madison Avenue advertising firm to conduct research. The foundation is looking to survey millennials in 2017 and compare responses garnered in a 2011 survey. Racial minorities also remain less engaged with the parks, a trend the foundation seeks to reverse. Yet lack of interest seems like a distant problem now, with visitation hitting a record 300 million  nearly equivalent to the United States population. 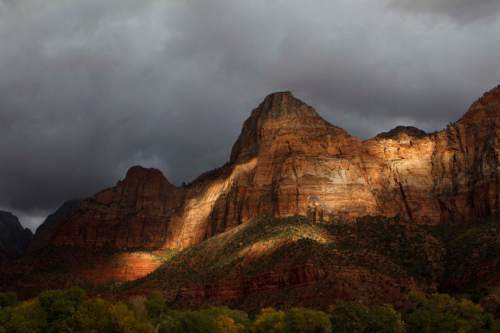 Utah&apos;s five national parks all beat records that were set the previous year. A case in point is Bryce Canyon with 1.7 million visits as of December, about 275,000 more than the previous year. 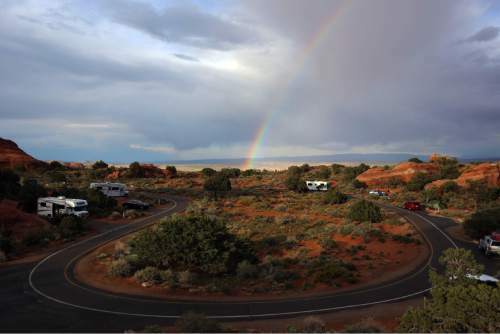 Crowding at this high-elevation park is not as intense as at Arches and Zion, but there are times in summer when motorists have to wait an hour to park a car, according to Kathleen Gonder, the park&apos;s chief of interpretation. To alleviate some of this traffic, the park just completed a 6.6-mile paved bike trail connecting Ruby&apos;s Inn with Inspiration Point. "The challenge for us is visitor safety as well as protection of the resource. We have a lot of concerns we have to watch," Gonder said. "It boils down to simple things like keeping restrooms stocked and clean." Park bathrooms can dispense as much one mile of toilet tissue per stall per day at peak seasons. Jarvis expects 2016 to be another record year, thanks largely to low gasoline prices, a weak U.S. dollar that makes travel affordable from European and Asian countries and publicity surrounding the centennial. Utah&apos;s "Mighty Five" marketing campaign has been credited  or blamed, depending on your perspective  with last year&apos;s banner visitation at southern Utah&apos;s Zion, Bryce Canyon, Arches, Capitol Reef and Canyonlands national parks. But visitation was up at all 13 of Utah&apos;s NPS units, which include Dinosaur, Natural Bridges and Timpanogos Cave national monuments, as well as NPS destinations just outside Utah&apos;s borders, like City of Rocks in Idaho, Great Basin in Nevada, and Mesa Verde in Colorado. Numbers also soared at Utah&apos;s state parks, particularly those in southern Utah that offer stunning geologic features and vistas, like Dead Horse Point, Kodachrome Basin, Snow Canyon, Goblin Valley and Kodachrome Basin. Systemwide, visitation was up nearly 20 percent over the previous year for the four-month period of July through October, to 2.5 million in 2015. Utah&apos;s Zion and Bryce both deploy shuttle buses on their main dead-end roads serving popular destinations. Accordingly, steady streams of hikers clog trails at bus stops, such as Zion&apos;s Emerald Pools and River Walk and Bryce&apos;s Amphitheater. "It&apos;s a dilemma that impacts the park experience, but those people on the River Walk are still having a great experience," said Jarvis, referring to the popular stroll along the Virgin River where it exits a narrow canyon. And there will always be quiet places for those willing to seek them out, he said. "I can take you to Yosemite Valley on July 4 and within five minutes get you to a place where you are all alone," Jarvis said. In Zion, solitude awaits anyone who hikes from the park&apos;s east entrance, or continues past Angel&apos;s Landing toward the West Rim. But accommodating cars remains a top challenge at Arches and Bryce, where every parking space is sometimes filled at midday. Bryce Canyon opted against barring private vehicles in the peak season, as Zion has done for years. Arches is developing a plan that could include timed entrances, reduced fees during off-peak times and a reservation system. While visitation has boomed, the national system  which now has 409 units  has not grown much. During Jarvis&apos; tenure at the helm, which began in 2009, 19 units have been added to the NPS menu, but they are mostly small sites of historic importance, such as a piece of Maryland&apos;s Eastern Shore used by Harriet Tubman for conducting slaves to freedom. Congress designated nine of these units, while President Obama designated 10 under the Antiquities Act. Obama&apos;s large designations, such as Basin and Range National Monument, are administered by the Bureau of Land Management, not NPS. The park service&apos;s perennial challenge is funding. To stretch budgets, maintenance has been chronically deferred, and now represents an $11.5 billion need. The recent Transportation Bill injects $268 million a year to address deteriorating roads, but NPS also oversees 75,000 non-road "assets," many of them historic buildings suffering from neglect. Jarvis needs $4.5 billion to take care of these structures, including some $150 million to replace a water line spanning the Grand Canyon. The record $288 million parks collected in entrances fees last year covered less than 10 percent of NPS&apos;s $2.8 billion budget. Eighty percent of what a park collects stays with the park, with the rest spread around to units that don&apos;t charge fees. Conservationists like David Nimkin also see public apathy as a threat to the parks. If citizens stop valuing them, they will be more likely to tolerate incompatible uses on inholdings (land owned privately inside the park boundaries) and adjacent lands, according to Nimkin, southwest director for the National Parks Conservation Association. The group&apos;s "Parks in Peril" campaign highlight threats like mineral development, smog, overfishing and commercial real estate. No park is more under siege than Grand Canyon, the system&apos;s crown jewel, where real estate projects are proposed around the edges and ATV use and uranium mines abound near the North Rim. Three brothers from Italy want to build a 3-million-square-foot mall on a 320-acre inholding near the town of Tusayan on the South Rim. Park superintendent Dave Uberauga is asking the Forest Service to deny the developers permission to build an access road across national forest land. "It isn&apos;t in the best interest of anybody. They want a piece of the Grand Canyon and I say it&apos;s not for sale. It detracts from the park across the board. They want to expand the airport, they have not declared a water source," Uberauga said. "The town has focused on affordable housing as a trade off, and that&apos;s BS. This is a World Heritage site; all land managers have an obligation to protect it." Meanwhile, the Grand Canyon experienced record visits last year  5.3 million, up 20 percent after 20 years of flat visitation. Uberauga said he can always tell by the look on visitors&apos; faces if it&apos;s their first time to the canyon rim, where a billion years of geologic history falls 4,000 feet into the world&apos;s largest abyss. "Every day I see tears on people&apos;s faces," Uberuaga said. "I have to keep that going. I have to find a way to do it. It&apos;s really hard."